•	Closed: 4" w x 7.25" h Open: 14.5" x 14.5"
For the power knitters amongst us, a case large enough to pack in TWO sets of interchangeable tips & Cables - Includes 30 numbered pockets for your tips, 4 pockets for your cords and a zip pocket for the accessories! Both metric and US. 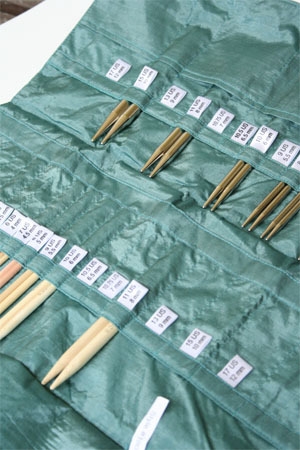 This is especially great - you can take a metal set, like the turbo or lace from ADDI, and a bamboo set, like the Naturas. 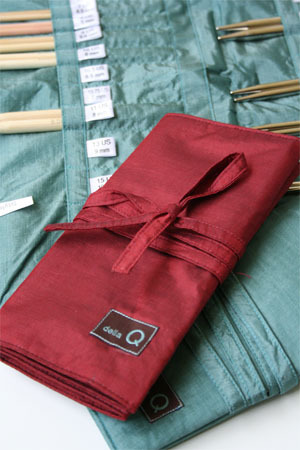 A nice, snug little travel case - when you need to take all your tips!